The Biggest Loser - The show keeps chugging along, and despite there being no shows to recap except this, the blogging goes on. Blah. Thankfully, this is the last week on-campus so it's almost over. Now onto 2 hours of time filler with only 4 contestants left. Only 2 losers are guaranteed spots in the finals, so everyone works out like crazy and puts numbers on their arm as motivation. It only reminds me of that yearly Baywatch episode where they do the Iron Man. There is a Jennie-O $5,000 challenge for the best turkey burger recipe. The other prize, probably better for their unhealthy family, is that Jennie-O will also send a family member of their choice to the Biggest Loser Lodge to get their own transformation. The critics for today's competition are total jerks: children. Olivia makes a green slime burger, which is Greek yogurt with green food coloring. You'd think kids would like gross stuff but it turns out food shouldn't look like Nickelodeon splooged all over it. Hannah puts honey mustard and cheese on her turkey burger. Jay forms his turkey batter into a mini volcano and fills the center with ketchup and cheese so it'll bake and overflow. Irene's burger has cheese, turkey bacon, and "fancy fry sauce." Wait, where have I heard fancy sauce before? Totally blanking, but I know it was reality TV. 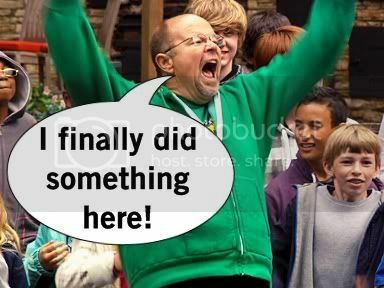 Jay receives the most votes from the kids and wins the $5k and the Biggest Loser Ranch prize (for his wife). There is one last challenge to "overcome obstacles" which translates to obstacles on a golf course and preparing for the finale. Last season's winner, Patrick, comes onto the green to do nothing. The challenge itself is to carry golf bags holding all the weight they've lost since arriving on campus, bit by bit. You've seen this challenge every year so no explanation necessary. The winner of the challenge gets an at-home gym installed in their home, which is a pretty great prize considering how hard it is to motivate yourself to go to the gym sometimes. Set to motivational music, the losers emotionally drop their weights. Hannah completes the course first and wins the gym (worth $15,000). But there's one more little surprise: everybody's going home with an arc trainer, whatever that is. There's one final last chance work-out, set to motivational music, where the losers and trainers get one last hoorah together. Cue the voiceovers that I fast forward through cause it's weigh-in time and I reeeeally want to watch The Good Wife on time. Irene loses 3 lbs, bringing her down to 144 lbs (she's lost 111 lbs on-campus). Jay gets on the scale and loses 4 lbs, making him 242 lbs (he's lost158 lbs since beginning the show). Olivia and Hannah, the sisters, hope to be the first female pair to make it to the finale together. Olivia drops 4 lbs, automatically advancing her to the finale; she has lost a total of 112 lbs and weighs 149 lbs now. To advance to the finale, Hannah needs to have lost more than 3 lbs. Beep, beep, beep, commercial break. Hannah loses 4 lbs and joins her sister in the finale (and lost 102 lbs total since being on campus). What a happy story! And so Jay and Irene fall below the yellow line, though Irene is technically the Biggest Loser On-Campus for the season. 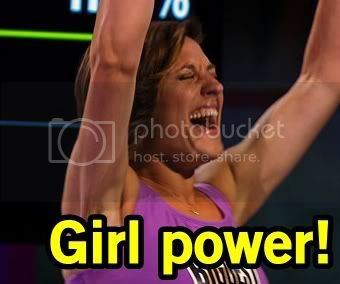 Now America will get to decide who moves onto the finale but I think it's totally obvious it will be an all-girl finale. Girl power! Special Edition! The Voice - I thought only recapping The Biggest Loser would be super lonely, so I'm doing a super-special recap of NBC's newest hit, The Voice. So while you're watching Scotty McCreery make pageant faces on Idol I'm watching some legit talent get cheered on by dwarves (Christina Aguilera, Cee Lo). Ok, so the rules of The Voice. Judges sat in backwards chairs and selected a team of 8 people based solely on their voice. Each week, 2 singers from each team are selected by their coach compete against each other, dueting to a current pop hit, and one person moves onto the live show starting in a few weeks. The coaches are Christina Aguilera, Gnarls Barkley/solo rapper/My Super Sweet 16 party thrower Cee Lo Green, Adam Levine from Maroon 5, and some country dude named Blake Shelton who I don't like. Each coach also has a "trusted advisor" and Blake half wins me over for picking Reba "Fancy" McIntyre. Wow, easier than I thought that would be. It is now week 2- aaaaand scene. Cee Lo pairs up afro'd, soulful Ty and bearded, bluesy Nakia to perform Neo's "Closer" (Angie and Jesse's wedding song!! Soap moment, bear with me). To better fit their vocal stylings, "Closer" is reworked to be less of a cover and a more unique rendition. After coaching from Cee Lo and advisor R&B singer Monica, the Texans enter the ring (the stage is a ring) to battle. Nakia sounds like (and looks like) Horatio Sanz singing on an SNL skit. While Ty is a good singer, nothing stood out to me so even if he sounds like Horatio Sanz, I'd vote for Nakia to move on. The coaches give feedback after and, no surprise, they like them both sooo much. However, Nakia steals the show for me, the coaches, and ultimately the one vote that matters: Cee Lo's. He moves onto the live show. Blake's team battles next and he sets duo Elenowen against rocker Jared Blake to battle to "Ain't No Mountain High Enough" by Marvin Gaye. I think my favorite part is when Blake demonstrate and sings it as if this song is new to everyone. I'm not a fan of Blake. Jared's dance moves are hella corny and makes it weird to watch. I actually thought as a trio it would sound god awful, but it's not too bad but there are pitchy spots. I wanted to like Elenowen more, but I thought the girl had some bum notes. I don't like either singer really, but someone will stay around. What a surprise, the coaches like everyone's peformance! We get it. Reba's input really matters and she said Jared rocked it and Elenowen were uncomfortable with the song. 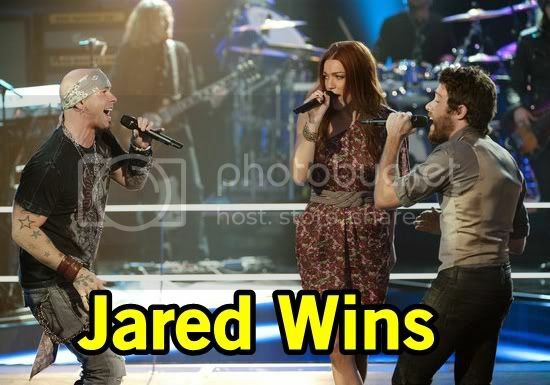 Blake feels bad dumping Elenowen since he begged for them to join his team, but names Jared Blake the winner of the face-off. Adam Levine's battle is Javier, that guy from all The Voice commercials pre-season, vs. Angela, who is rocking a Cherry Warnimont headband. They will perform the classic tune "Stand By Me." Adam and Maroon 5's musical advisor coach the singers to take this simple song and really make it special. Javier is pretty amazing. The voice has star power, but Angela is pretty fantastic as well. A real battle this time because it's kind of a toss-up. 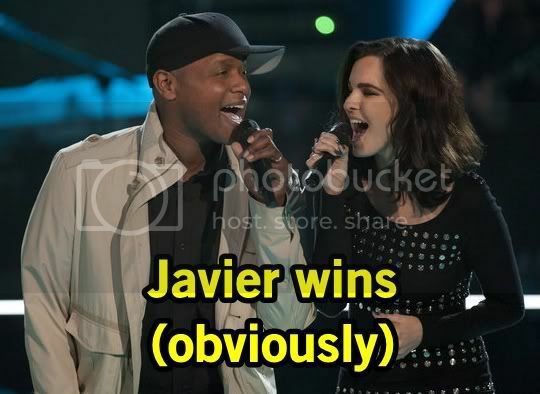 I've selected Javier as my pick to win for his consistent since Angela had some botched notes near the end. The coaches look blown away by the talent on Adam's team this week, but it's obvious who the coaches prefer (poor Angela). Javier easily wins the battle- no brainer. Christina Aguilera, who is not Snooki in a platinum wig, selects Beverly with the shaved head and Justin to battle to "Baba O'Reilly." Christina and her advisor, Australian singer Sia (? ), get their coach on and Beverly is super passionate when she sings. Justin has never performed this song before and doesn't know the lyrics, so I guess he never listens to classics because everybody knows this song. But his voice is gritty and goes well once he starts to get the hang of it. Beverly is just such a badass and her voice reminds me of Melissa Etheridge so I vote for her, but I give them both thumbs down for waaaaay too many vocal runs. Stop wailing! The coaches are pretty split and impressed that Justin held his own, but Beverly is a force to be reckoned with. Beverly wins the battle and heads to the live show. So there you go: The Voice. Initially I had no desire to watch what I interpreted as an Idol rip-off and a beat-you-to-the-punch X Factor, but this show has surprised me. Good talent, the coaches are OK. Way better than this horrible, lackluster season of Idol.